See the John H. Kerr Dam and Reservoir website for additional information. Primary recreational opportunities are listed below. Take a Virtual Tour of John H. Kerr Dam and Reservoir! Directions: From Raleigh, north on US 1 to I-85; west on NC 1224, exit 223; north on NC 1200, which turns into VA 4 at State line. From Richmond, south on I-95; south on I-85 toward South Hill; West on US 58, exit 12; South on VA 4. Factoid: John H. Kerr Dam & Reservoir, also known as Buggs Island Lake, is a 50,000-acre lake extending 39 miles up the Roanoke River along 800 miles of wooded, cove-studded shoreline in Virginia and North Carolina. 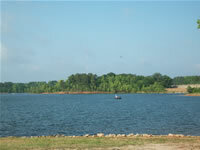 Visitors enjoy fishing, camping, swimming, boating or just relaxing and enjoying the scenic beauty. There are 30 recreation areas around Kerr Reservoir: campsites, swim beaches, picnic areas, hiking, nature trails, marinas all available for public use. There are 26 wildlife management areas on Kerr, totaling over 10,000 acres. In addition to flood control and hydroelectric power, other benefits include fish and wildlife conservation, recreation, forest management, and water supply.